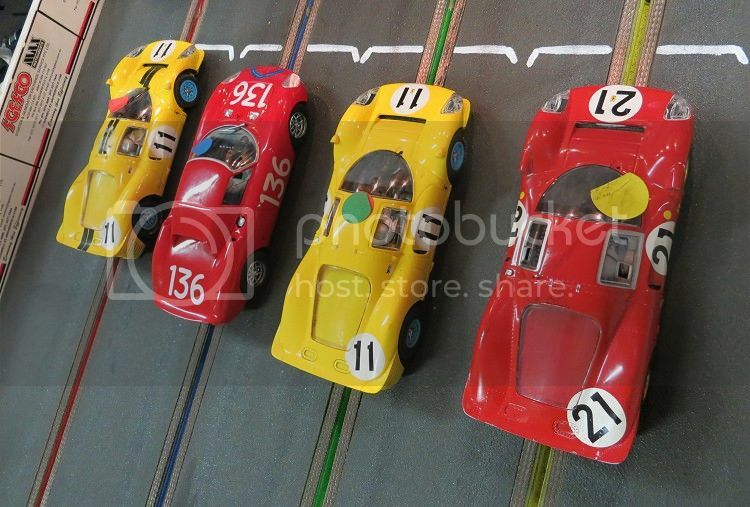 Once again a fair turnout for the LCR and Slotcar Legends categories were appreciated by all. 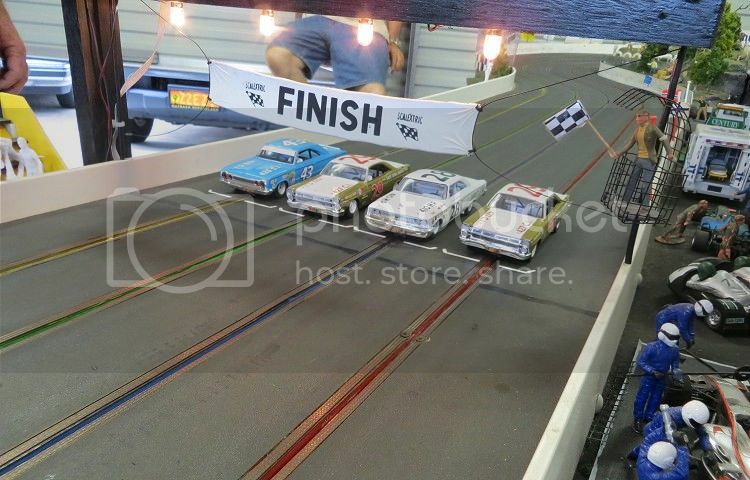 Classes chosen for the night were JGTC, Classic NASCAR, European ti tops and Classic Le Mans. The first class to be run was Classic NASCAR while we were waiting for people to turn up. This is always a good class and in the past has been made up of a mixture of Monogram and Carrera models, but this time it was almost exclusively Monogram. Moby drove a particularly sticky car and stamped his authority on the race. Next up was Euro Tin Tops , these are Scaley and Ninco European touring cars, with original magnets for what they are worth. The size of the LCR circuit suits both these models and there is nothing between them on the track. Some of the newcomers to (almost) non magnet racing took to it fairly well. The popularity of this class may well see maybe a second non magnet class run. In the meantime it was to be the old hacks who succeeded. Was it to be me, or was it to be Greg. As it happened, Greg's car developed problems and it was all he could do to finish one of the heats. Next up was an invitation race, JGTC's is always a fast class and this event was no exception. With a coupe of guys having to run a sub for this class it was still great to watch the action. But once again Phil and Greg capitalised on HTA (home track advantage) and finished comfortably at the pointy end although they were not the fastest cars on the track. That honour went to Caleb. Last up was Classic Le Mans and once again there were a couple of models short of the class. This is when we allowed some other class cars to participate. LMP's weren't quite what we were thinking of but we went ahead anyway. Needless to say the LMP's were dominant and the end result was not indicative of class compliance. For the record the compliant car positions were 1. Karl 2. Phil 3. Greg 4. Bill with the rest following on from that group. Once again some good classes and some good cars. 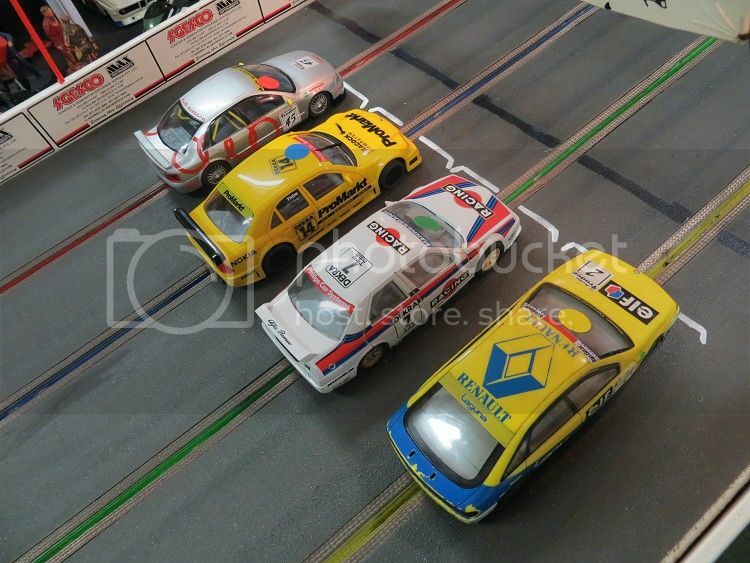 If you would like to race with the Slotcar Legends in the Brisbane area contact me at pwix@yahoo.com. Don't be put off by the number of classes we run, there are always competitive models available to loan for the evening.